European finance ministers inched forward towards beefing up the euro zone's rescue fund and preparing new stress tests for the region's shaky banks, dashing market hopes of quicker action. The sluggish approach could test the patience of investors, spooked by the euro zone debt crisis, who sold off peripheral euro zone bonds this month until the European Central Bank intervened to steady markets. Ministers of the 17-nation currency area explored ways to raise the effective lending capacity of their financial backstop but reached no conclusion, and they remain locked in dispute on tougher criteria for checking banks' ability to resist shocks. The risk premium on 10-year Portuguese and Irish government bonds rose as traders took stock of the news, or lack of news, from Brussels. Two banks based in the Irish Republic have passed stress tests carried out to establish their potential resilience in difficult economic circumstances. 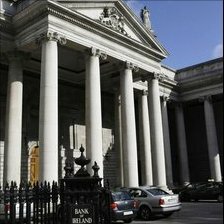 Both Bank of Ireland and AIB faced a series of checks on how they would fare should the economy worsen and suffer problems with sovereign loans. Ninety-one banks across Europe were subjected to the test. Seven failed. The report was carried out by the Committee of European Banking Supervisors. Passing the test means AIB is assumed to be able to raise a further 7.4bn euros by the end of the year. If it fails to do so, the Irish government may have to step in to meet any shortfall. Bank of Ireland has already raised the capital required of it. The banks had already passed more severe stress tests carried out by the Irish Financial Regulator in March. Irish finance minister Brian Lenihan has welcomed the outcome of the tests for AIB and Bank of Ireland. He said they vindicated the financial targets set for the banks by the Central Bank and Financial Regulator earlier this year. He added that he welcomed the increased transparency that the EU-wide test had brought to the banking system. What happened 3 months after is history! Please spare us!